This decal goes on the light switch cover and is made specially for true fans of Star Wars. 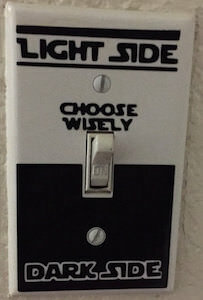 The decal has a light side and a dark side and in the middle it says “Choose Wisely” and all that makes it great fun for Star Wars fans and every night you can choose for the dark side by moving the switch to that side and if you put the decal right then you whole life turns dark instantly. So if your home can use an amazing light switch that helps you choose between the Rebels or the Empire then this is what you want.